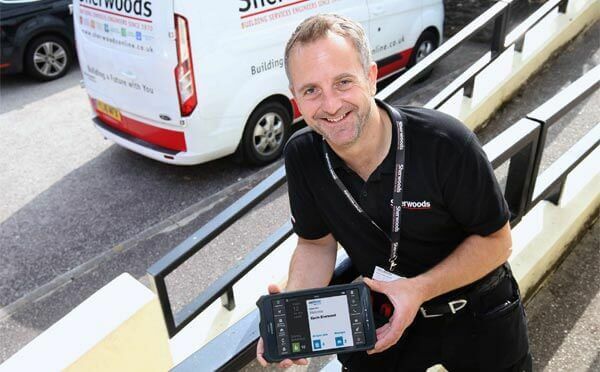 Sherwoods’ field service engineers are equipped with the latest ruggedised tablets running a completely paper-free system. The mobiles are live connected to the cloud hosting a complete management solution from BigChange that covers everything from CRM to routing, purchasing, job scheduling, certification and invoicing. Founded in 1970, with a 48 year history and still family owned, Sherwoods provides a genuine one-stop-shop range of services and has grown to become one of the fastest growing sustainable FM building services providers, covering all of the South West UK. The company has grown organically with successful apprenticeships underpinning growth. Sherwoods has long been an early adopter of technology with vehicle tracking first employed back in 2003, and digital service management software and PDAs employed across all operations since 2007. Sherwoods has a 35-strong team of mobile field engineers, residing across the region and working from home providing comprehensive coverage across the UK South West region, including Hampshire, Bristol, South Wales and Cornwall and all postcodes in between. Services include Compliance, PPM, Project, planned & reactive maintenance 24-7 365 days a year. Sherwoods’ mobile field engineers use JobWatch for everything from timesheets, jobsheets, signature capture and certification – with photographs. JobWatch is used 100% of the time to provide an evidential record of all works, with GDPR compliant, real time data, always available online.